In this blog, artist Josie Vallely explains how she became involved in the 2015 Glasgow Wildlife Garden Festival, and how the artwork for the festival leaflet was created. My name is Josie Vallely, and I am an artist and designer based in Glasgow. I have been working as an artist full time since I left Glasgow School of Art last year. I do lots of different kinds of work: drawings, paintings, textile works, maps - you name it - and I work with all kinds of organisations and community groups, as I'm interested in people and nature! I got involved with the garden festival project after seeing the opportunity advertised. I've always been a member of the RSPB, and they are one of my favourite organisations, so I was excited to apply for the role. I have done some drawing for RSPB Scotland before, at their Big Nature Festival at Hopetoun house, so it was great to be able to get involved again. Aside from art and design, nature is the most important thing to me, and I love being outside and exploring Scotland's wildlife, so it's a dream job to get to draw sparrows, water voles and bats! I think it is really interesting the RSPB have decided to get an artist involved in the festival, and I think it helps bring the nature all around us alive. 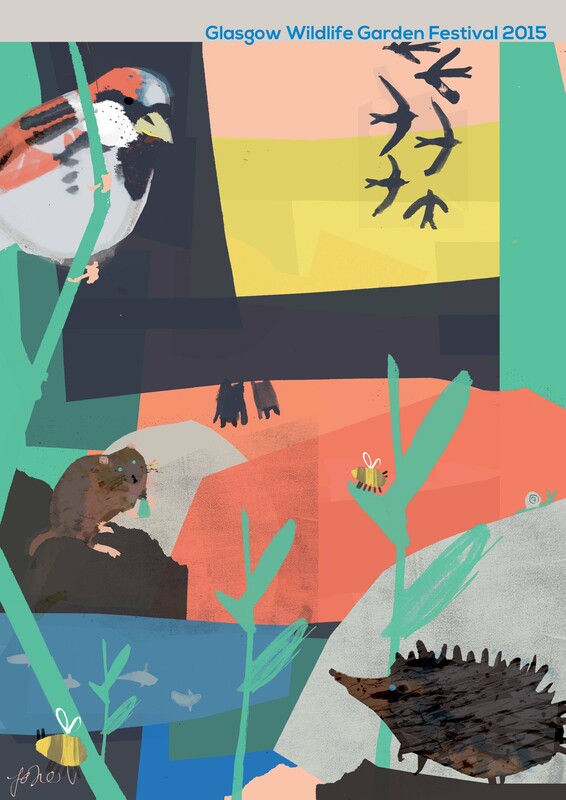 For the leaflet, I decided to work on a striking, graphic image based on digital collage techniques, using patterns created In community workshops inspired by the RSPB Glasgow priority species: house sparrows, pipistrelle bats, hedgehogs, bumble bees, water voles, and swifts. The workshops took place on a busy afternoon in Kelvingrove Art Gallery and Museum, where we created textures painted with paintbrushes crafted from nature. Have you ever tried painting with a pine cone? It's messy! After the workshops I took all the work that was produced and scanned it into my computer. I drew lots of animals, plants and shapes, and then I used all of the different patterns and drawings to create a patch-worked collage of critters, which echoes the rich variety of wildlife and spaces in Glasgow, as well as paying homage to the ‘homeliness’ of the festival. I hope it encourages people to get wrapped up in the nature on their doorstep!